Who’s got two thumbs and loves Anthony Bourdain’s Les Halles Cookbook? This recipe is a multi-day winter-feast-extravaganza experience. We ended up using goose instead of duck for the confit, but everything else we did was more-or-less as Tony told us to. Day one: Rub the duck legs fairly generously with sea salt, place in the shallow dish, cover w/ plastic, and refrigerate overnight. At all times, keep your work area clean and your ingredients free of contamination- meaning don’t allow any other foodstuffs like bread crumbs or scraps to get into your duck or duck fat or confit, as they will make an otherwise nearly nonperishable preparation suddenly perishable. Day two: Preheat the oven to 375 degrees. Render (melt) the duck fat in the saucepan until clear. After seasoning with the black pepper (not too much), place the duck legs in the clean, ovenproof casserole, nestle the thyme, rosemary, and garlic in with it, and pour the duck fat over the legs to just cover. Cover the dish with foils and put in the oven. Cook for about an hour, or until the skin at the “ankle” of each leg pulls away from the “knuckle.” The meat should be tender. Day one: Place the beans in the large bowl and cover w/ cold water so that there are at least two or three inches of water above the top of the beans. Soak overnight. Day two: Drain and rinse the beans and place in the large pot. Add the pork belly, the quartered onion, 1/4 lb/112 g of the pork rind, and the bouquet garni. Cover with water, add salt and pepper to taste, and bring to a boil. Reduce to a simmer and cook until the beans are tender, about an hour. Let cool for 20 minutes, then discard the onion and bouquet garni. Remove the pork belly, cut it into 2-in/ 5-cm squares, and set aside. (If you plan to wait another day before finishing the dish, wait to cut the pork belly until then.) Strain the beans and the rind and set aside, reserving the cooking liquid separately. In the saute pan, heat all but 1 tbsp/14 g of the duck fat over medium-high heat until it shimmers and becomes transparent. Carefully add the sausages and brown on all sides. Remove and set aside, draining on paper towels. In the same pan, over medium-high heat, brown the sliced onions, the garlic, and the reserved squares of pork rind from the beans (not the unused pork rind; you’ll need that later). Once browned, remove from the heat and transfer to a blender. Add 1 tbsp/14 g of the remaining duck fat and puree until smooth. Set aside. Preheat the oven to 350 degrees. Place the uncooked pork rind in the bottom of a deep ovenproof earthenware dish. You’re looking to line the inside, almost like a piecrust. Arrange all your ingredients in alternating layers, beginning with a layer of beans, then sausages, then more beans, then pork belly, beans, duck confit, and finally more beans, adding a dab of the onion and pork rind puree between each layer. Add enough of the bean cooking liquid to just cover the beans, reserving 1 cup/225ml in the refrigerator for later use. 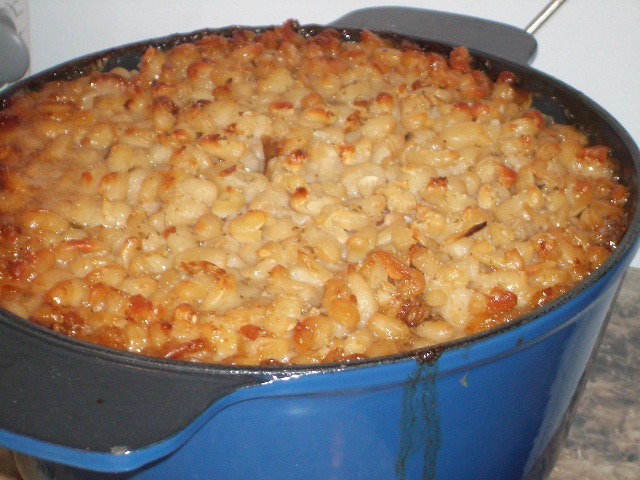 Cook the cassoulet in the oven for 1 hour, then reduce the heat to 250 degrees and cook for another hour. Remove from the heat and allow to cool. Refrigerate overnight. Day three: Preheat the oven to 350 degrees again. 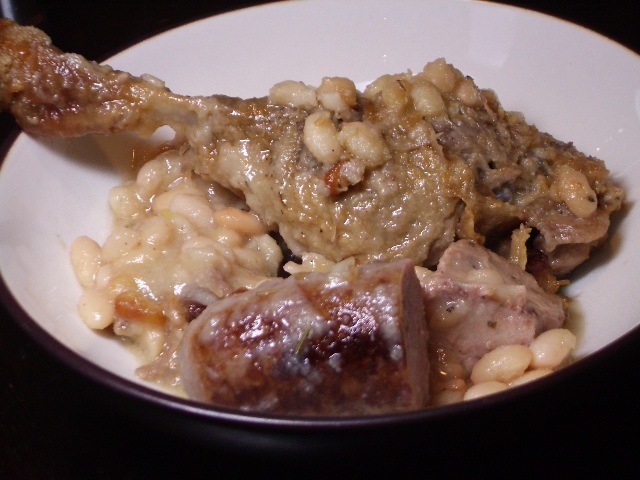 Cook the cassoulet for an hour. Break the crust on the top with the spoon and add 1/4 cup/56 ml of the reserved cooking liquid. (Don’t get fancy. Just pile, dab, stack, and pile. It doesn’t have to be pretty.) Reduce the heat to 250 degrees and continue cooking for another 15 minutes, or until screamingly hot through and through. *Bourdain’s recipe calls for Tarbais beans. After seeing these for $15-25 per pound, we couldn’t reasonably a) buy them or b) recommend them on a frugal foodie blog. So, we used Great Northern beans instead. These worked out well, but we’d also recommend cannelini beans if you can find them dried instead of canned. If you’ve got the money to burn, go for the tarbais beans – apparently they’re worth it!